We know what’s happening. Things are changing. For some it is the beginning of the end of the world. For most of my readers, it is the middle of a shift from one world to another. We’ve learned to reverse the usual assumption that physical evolution has brought about the advent of consciousness. Instead, we realize that consciousness is the source of evolution. We are in the midst of the end of the age of materialism and entering the age of spirituality. We have heard about the mysteries of quantum physics, and how everything is connected. We are aware that intention is everything. We create our own reality, not by material means, but by the stories we tell ourselves. I’d like to introduce you to a fantastic story teller, one whose credentials are superb, and whose attention to details of fact creates an even more believable story than those who skim across those facts. C. Dave Pruett is a mathematician, recently retired from James Madison University. For several years he taught a course for undergraduate honors students, a course than earned him a Templeton award for integrating science and religion. The name of his course was the name I’ve given to this review: “From Black Elk to Black Holes: Shaping a Myth for a New Millenium.” What excited and turned on college students for several years can now excite and turn you on—his book on this broad topic: Reason and Wonder: A Copernican Revolution in Science and Spirit. There are two special qualities of this book that make it particularly attractive and appropriate for my readers. The first is that it tells a well-known story in a very different manner. That well known story has to do with the “three revolutions” that Sigmund Freud pointed out to us at the turn of the twentieth century. The first, which Pruett calls the “cosmological” revolution, concerned the discovery and final acceptance that the earth revolved around the sun, not the other way around as we had all assumed. The second was the biological revolution, which revealed that we evolved from the apes rather than landing here suddenly in full human form. The third revolution, the one Freud liked to take credit for, was the consciousness revolution, showing that ego-consciousness is but the tip of a large iceberg. We typically consider that each revolution was at first a heresy, and each created a split between science and religion. What is unique about Pruett’s telling of this story is that he introduces us, in great story telling fashion, to the lives of the scientists who participated in these revolutions. What is surprising is how spiritually committed were these scientists. In so revealing this under-appreciated history, Pruett bases a new approach to reconciling reason and intuition, science and spirituality. The second feature of Pruett’s book, one that makes it especially worthwhile for me readers, is that he shares with us the science, the facts, the hard-core theories, etc. and does it without sharing any more than three equations! (The number of equations in a non-fiction science book is thought to relate, inversely, to the potential popular appeal of a book.) Although I’ve read several books on the theme of “down the rabbit hole, I realized in reading Pruett’s book that I’d never really encountered the actual facts that make up the story of how we got from Galileo’s telescope to the discovery of gravitation waves. Reading this material gives you a very solid foundation for our contemporary belief that everything is ultimately one consciousness, evolving, growing, and embracing knowingly the whole. Thus the farthest out ideas come across as solid as the tools of the laboratory. Pruett has received quite a lot of praise for his ability to tell a great story about a history we think we know, not hold back the details (except for the equations), leaving us more knowledgeable as well as wiser. I had to find out what was behind the creation of this gem, and so I arranged for an interview. I present it here, and believe that after you get to know Professor Pruett some, you’ll want to read his book. Q1: What is this book about? Q2: Why did you want to write this book? Reason and Wonder is my first and only trade book. I don’t know what compels others to write, but I suspect that few write books because they want to; they write because they must. Some inner chaos needs order, some demon needs exorcism, some angel needs wings, or some muse or channel needs a voice. Possibly all of the above. So, I wrote Reason and Wonder simply because I had to. Reason and Wonder came from an intense personal struggle to integrate my rational and intuitive selves, which, while in conflict, hampered the formation of a mature identity. The surprise for me is that what I originally thought of as a purely personal struggle is very much a Western cultural one, whose societal implications play out in the current tension between science and religion. Q3: Tell us something about the process of writing. That statement was 100% accurate and incredibly naïve. Writing Reason and Wonder was so much more difficult than I could ever have anticipated. Thirteen years would elapse from the setting of intent until the hardback appeared in 2012. I experienced many false starts and moments when I was ready to abandon the project. I told few people what I was doing because the outcome seemed so elusive. In looking back at the process, however, I am flabbergasted by the patterns that emerge. I seem to have been more sculptor than writer. In 1999, I had only a block of granite and a vague notion of a figure trapped inside in need of release. The first draft simply chipped away here and there to reveal the outlines. Each draft – and there were six complete drafts – gave greater definition. The final draft polished the marble into what I hope is a work of beauty, at least in the eyes of some beholders. What is perhaps most astounding in retrospect is that writing a book – at times so solitary – is necessarily a community endeavor. Time and again I was rescued from frustration or despair – often from unlikely sources -- by a word of encouragement, a clipped article, a loaned book, a volunteer to read a yet unpalatable draft, or the amazing classroom insight of a student. And more often than not, the synchronicity of these events was uncanny. Q4: What would folks find most surprising were they to read this book? Perhaps many of the revelations and discoveries that kept me writing will keep readers reading. That, just as one’s life seems to make a kind of sense from the vantage point of advancing age, so does the history of the universe make a kind of sense from the perspective of 13.7 billion years. That the prime motivation for history’s greatest scientists – Newton, Galileo, Kepler, Darwin, Einstein, among others – was childlike wonder, and that intuition in scientific discovery is equally as important as reason. That this sense of awe kept many of these great men (and women) going despite crushing personal misfortunes. That science and spirituality are kinfolk rather than enemies, because awe is the bedrock of each. “The most beautiful emotion we can experience is the mystical,” Einstein noted. “It is the source of all true art and science.” That in a dynamic cosmos, every moment is the moment of creation. And that all sentient beings, however flawed and mortal, are co-creators in the evolution of the cosmos. Q5: To whom should the book most appeal? Ask yourself: Am spiritually aware or awakening? Am I scientifically literate or curious? If either answer is “yes,” then Reason and Wonder is for you. However, if “yes” to both, then you are likely to regard Reason and Wonder as a true gem. But don’t take my word for it. Here are excerpts from an Amazon review by Charles Finn of Fincastle, Virginia. 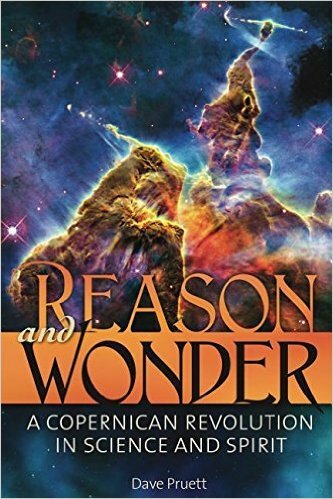 “Why might you want to read Dave Pruett's Reason and Wonder: A Copernican Revolution in Science and Spirit? “Because you appreciate a good story, especially when it's . . . the gripping, unfolding story of the universe and our place in it. “Because you'd love to have mathematics and physics brought a bit down from the clouds. “Because you're intrigued to see how revolutions in physics, biology and quantum mechanics could now be spawning a revolution in spirit. Q: Are science and religion fundamentally incompatible? No, in actuality, they are complementary. More fundamentally, they are kinfolk: each is rooted in the experience of awe. Conflict arises when either science or religion (or both) violates its domain by stepping on the turf of the other or by claiming more than it can rightfully claim to know as truth. In the same way that clear ego-boundaries help prevent misunderstanding and conflict for individuals in relationship, careful delineation of the boundaries of science and religion can help these two domains of inquiry complement rather than compete. These issues are dealt with throughout Reason and Wonder, but especially in Chapter 15: A World Aflame. Q: There's a lot of folks out there who find science to be dubious -- they get support by the news noting that there's a lot of fraud in science these days, politically driven. How might your book touch those folks? Well, I’m both a mathematician and a scientist with ten years of NASA-related aerospace experience. I generally find scientists to be pretty admirable human beings. The vast majority are on the path of truth. In my experience, scientists as a whole, skeptical by nature, are not-easily convinced and are abhorrent of fraud. However, if science has an Achilles heel, it is that, believing they are “objective,” most scientists are unaware of the blinders they wear in the form of scientific preconceptions. This is particularly true when it comes to so-called “paranormal” or “psi” phenomena, which many scientists reject out-of-hand because such phenomena -- despite the weight of a century of replicable evidence -- violate their preconceptions. These preconceptions -- among them determinism, reductionism, and materialism -- are named and critiqued in Reason and Wonder. Q: A lot of our readers today say they are not interested in religion, but spirituality. How might reading this book aid in their spiritual quest? I concur wholeheartedly with those readers! In fact, the process of writing Reason and Wonder helped me clarify, in my own mind, the difference between religion and spirituality. Of the two I’ve come to realize that spirituality is the real McCoy. For example, the Quaker educator and activist Parker Palmer defines spirituality as “that longing within the human breast that makes us want to connect with something bigger than our own egos.” I like Palmer’s definition because it’s universal. Everyone is spiritual; it’s a given. I’d go him a step further, in solidarity with Native American wisdomkeepers. Everything is spiritual. Spirituality is the unseen face of matter, to paraphrase Teilhard de Chardin, the Jesuit scientist-priest who held that every particle in the cosmos has a Within as well as a Without. Teilhard, by the way, figures prominently toward the end of Reason and Wonder. What then is religion? It is the discipline — the practice — of spirituality. Insofar as religion nurtures our spirituality, it is useful and positive. Insofar as it suppresses, anesthetizes, perverts, or extinguishes our spirituality – or divides the world into us and them -- it is negative, even evil. Years ago I heard Scott Peck speak, shortly after he’d written the self-help blockbuster The Road Less Traveled. Peck outlined four stages of spiritual development: chaos, fundamentalism, agnosticism/atheism, and mysticism, the third of which came as a surprise if not a shock. Those whose lives are chaotic often turn to fundamentalism as a curative. It works, but only temporally. Fundamentalism’s rigidity tames the chaos, but it does so by invoking a legalistic deity and a thicket of regulations so dense that one is trapped. The spiritual seeker who has fallen into the trap of fundamentalism, if he or she is lucky, eventually rebels against the “monster-God” and may even abandon the notion of God altogether for a time. Under the right circumstances, Peck saw agnosticism or atheism as a step of growth rather than the gateway to hell. But humans need meaning, and frequently the detour through unbelief returns the spiritual seeker to a more holistic and all-encompassing faith: mysticism. What joy then to discover that the world’s greatest mystics and the world’s greatest scientists are teaching essentially the same truths. Q: What have some reviewers said about your book that most pleases you? To explore Reason and Wonder on Amazon.com, click here!